From a tiger safari in the Sundarbans swamps to a quintessential Bangladesh boat trip on the Rocket Steamer from Dhaka to Khulna to a white-knuckle rickshaw ride on the crazy streets of Old Dhaka, Bangladesh is full of must-do experiences. But for people who want to dive a bit deeper, here are some of Bangladesh’s lesser-known gems to get your adventure juices flowing. The cool turquoise waters are reminiscent of a high-altitude mountain lake, but the China Clay Hills that surround them are no more than small mounds that reach a few metres above the farmland and river systems of north-central Bangladesh. It is an extremely photogenic spot and a lovely place for a tree-shaded picnic, but the main reason to venture this far north is for the journey itself. To get here, take a three-hour bus ride from Mymensingh to the small, forested village of Birisiri. It is then a tranquil three-hour rowboat trip up the Someshwari River, or a bone-rattling, but fun two-hour rickshaw ride, crossing the river in a small wooden ferry and then passing through a number of remote villages. This is what all ruins should look like. There is no fancy reconstruction or meticulous renovation, just a crumbling royal palace being slowly eaten by the surrounding vegetation. It is like something out of Disney’s animated film, The Jungle Book — you half expect a troupe of monkeys to scamper past you singing. Make sure you take a guided tour from the extremely enthusiastic English-speaking caretaker, who helps brings the whole place to life for the handful of tourists who make the journey. To get here, take a 30-minute bus ride from Mymensingh to the village of Muktagacha, then follow the signs from the main road. With its small-village atmosphere and collection of serene Hindu and Buddhist temples, the island of Maheskhali in south-western Bangladesh is an oasis of calm – a peaceful escape from the brash beach resort of neighbouring Cox’s Bazar. But it is the short trip over to the island that is the real treat. After navigating the long, rickety wooden pier at Cox’s Bazar, hop your way across a string of rowboats to get to the vessel that will take you to the island — either a nippy little speedboat (20 minutes) or, if you are lucky, a large converted wooden fishing boat that ferries locals across (50 minutes). You will have to dodge dozens of fishing boats as you leave the dock, before passing the huge and highly pungent fish market that serves the fancy hotels in Cox’s Bazar. Next along the riverbank is a small boat-building yard. And finally, just before you head out to sea, you will pass a series of fascinating ice-making houses where huge blocks of frozen water slide down rollercoaster runners and into the waiting boats. Like other, more famous floating markets in southeast Asia, locals come to Banaripara to buy and sell groceries without ever having to step off their boats. 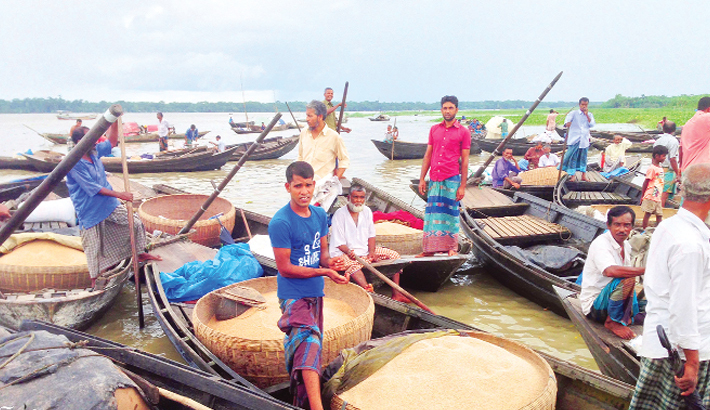 This particular market in this river-crossed part of Bangladesh deals almost entirely in rice, which makes a fascinating and unusual foray while travelling through southern Bangladesh. Saturday is the busiest market day here. Banaripara can be reached by bus from Barisal.